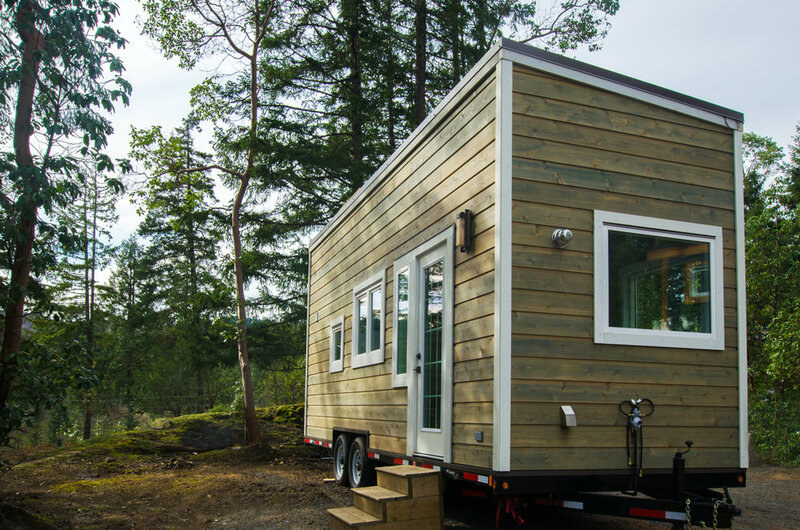 An interview with the ultimate tiny home DIY duo! It’s been over a month since we delivered a custom 24’ trailer to Leala and Zach in Courtenay, BC. Together they run a vlog and Instagram titled, Big Hearts Tiny Vegans, where they chronicle their adventures of moving from the big city to beautiful BC, in search of the good life. Leala and Zach have made tremendous progress building their own tiny home, and we caught up with them to ask about the process. 1. You have talked about the importance of living deliberately and simply. How does going tiny embody these ideas for you? For us, going tiny embodies an escape from the everyday rat race. We often found ourselves in cities, paying high rent, for poorly managed places. The rent in cities is so high that we felt trapped in a cycle of living to work instead of working to live. Going tiny will enable us to have exactly what we need, while affording us the time we want to embrace the things we love. Simplicity, to us, is a life without financial burden. Without that burden, we can finally be purposeful with our time, and spend it bettering either ourselves, or pouring it into our passions. Or maybe just finding a bit more peace, and kicking up our feet more than now and again. 2. What have been the greatest challenges in this process so far? We are still in the infancy stages of the build. That being said, we must have gone through five thousand million different designs before we settled on the one we are currently constructing! The construction process so far has gone fairly smoothly, but at every stage there is a lot of research that has to be done, and there is a bit of stress that comes along with that. Probably the biggest challenge though, is the delicate balance of regular life and tiny house building. Working, paying bills, and budgeting materials can be a pain. When we are on a roll though, it is a lot of fun. Seriously, a lot. 3. I know you're still in the early stages of construction, but what do you consider to be the most important aspect of your future home? Where are you planning on focusing the most energy? The biggest thing for us is making the space feel like a home. We also are attempting to keep the build as green as possible, and plan to use recycled material for our siding, flooring, and cabinetry etc. Also using eco friendly wood finishes, to keep our space as clean of VOC’s as possible. At the same time, we don’t want to compromise the structural integrity of our home, or have leaky windows. So finding a balance has been a primary focus of ours. 4. What do you consider to be the most common misconception about living tiny? I think the most common misconception is that there is not enough space for life. We have been living in tiny apartments with two dogs for years, and we have always liked the intimacy of closer quarters. It does allow for a closer relationship, more cuddles, and less clutter. Since dogs are den animals they love it too. We think the real misconception is in standard housing. People feel they need a ton of space to have personal value. We used to feel that we needed more personal items to have a personal identity. We were among the ranks whose items defined them. After letting go of all those unreciprocated attachments, finding value in people has proven to be far more rewarding. 5. What is the most surprising thing you've discovered through this process so far? 6. Do you have any advice for those who want to follow in your DIY-live-vegan-and-tiny footsteps? An ethical vegan lifestyle has led us to where we are today and having less of an environmental footprint feels like the next gradual step for us. At the start of our journey we had to take a good hard look at the way we lived, the way we were socially conditioned and feel the void that was longing to be filled. It was through that process that brought us to a shift in perspective. The truth we come back to and need to remind ourselves of is that there is no planet B. How can we make a difference and embody the compassion we wish to see? I guess our advice would be to take an honest look at where your compassion lies and encourage yourself to live there. We try to find multiple uses for many materials such as clothing, building supplies and even food! 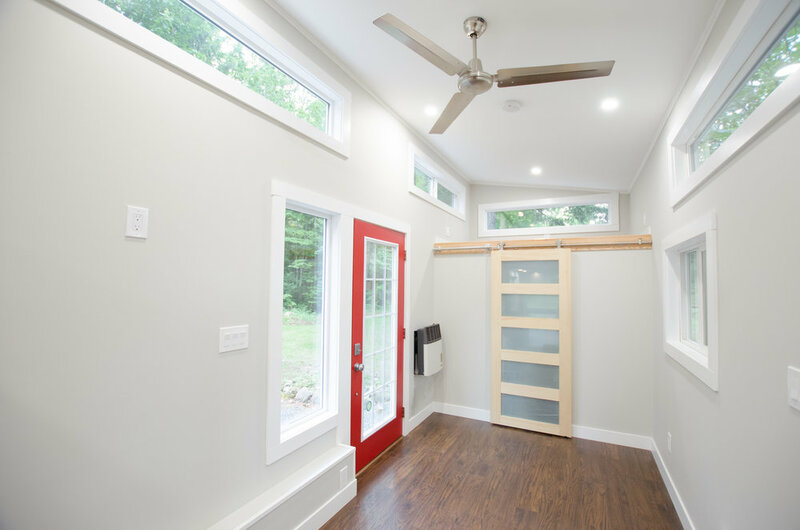 Trying to give life to things that have been cast aside is a creative challenge that benefits the environment, which is why we wanted to take on a DIY tiny house project! As far as an ethical vegan lifestyle is concerned, we found that embracing or eliminating one thing at a time is a great place to begin. The journey grows as you grow and it is important to let go of judgment of yourself and the world around you—take it one day at a time. It is empowering to know that the way you choose to live, can make a world of difference! 7. 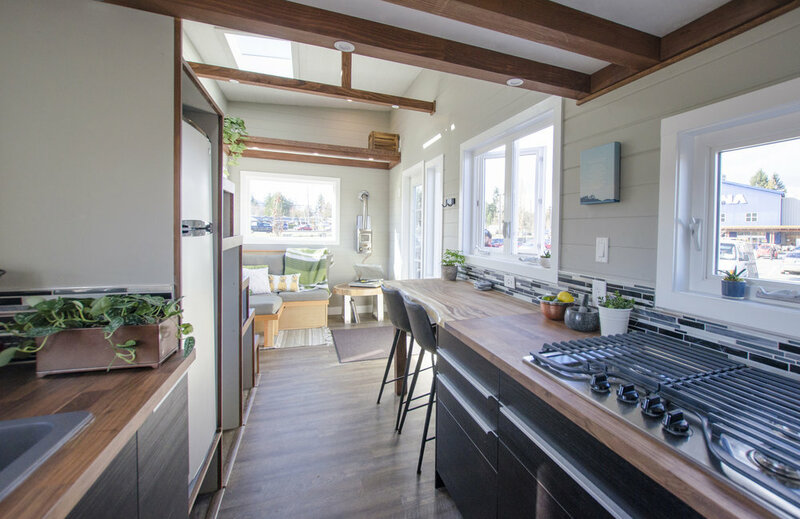 Are there any specific building materials or products that you’ve found to be particularly helpful in building your tiny home? One product we love is called Eco Wood Treatment. It’s all natural and commonly used in Banff and Jasper national parks! We used it to treat our plywood. You add it to water, it goes on easy and so far, it has been amazing. It’s also super affordable! Check out the product here. Can’t get enough of Big Hearts Tiny Vegans? Follow their journey! Interested in building your own tiny home? Purchasing one of our custom trailers is a great way to start your DIY journey on the right foot! Read more about our trailers here.